Will you be travelling by car? 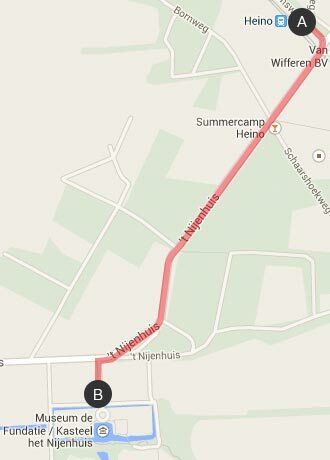 We advise you to use the parkings Emmawijk* or Burgemeester van Roijensingel, which are both within walking distance. Follow the P-route along the canals in the city centre. The Parkings are indicated on the blue road signs. 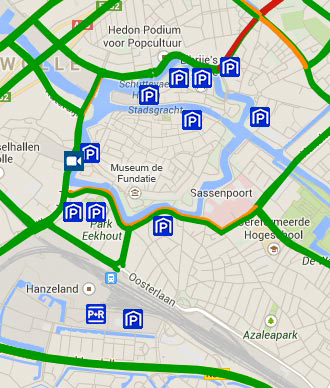 Click here for information on parking spaces for the disabled in the city centre of Zwolle. Museum de Fundatie's entrance for wheelchairs is located on the side of the Potgietersingel. If travelling by train: Museum de Fundatie is situated within walking distance of the Central Station in Zwolle. 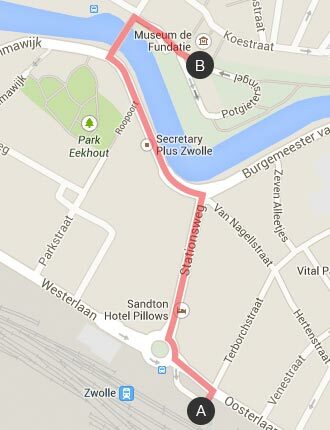 Follow the walking route via Stationsweg and Burgemeester van Roijensingel and you will arrive at the museum and the town centre in a matter of minutes. At the front of the museum (Blijmarkt) are plenty of bicycle racks where you can park your bicycle for free. (Folding) bicycles are not allowed in the museum. Are you travelling by car and are you using GPS? Street en number: 't Nijenhuis 10. City: Wijhe. alongside the main road where Kasteel het Nijenhuis is located, is a parking where you can park for free. If travelling by train: Starting at Heino's train station, keep the town at your back, cross the railway tracks and walk for about 20 minutes through the woods to Castle Het Nijenhuis (1200 metres). At the entrance gate of Kasteel het Nijenhuis, at the end of the driveway, you will find bicycle racks where you can park your bicycle. (Folding) bicycles are not allowed on the terrain (the castle and sculpture garden).